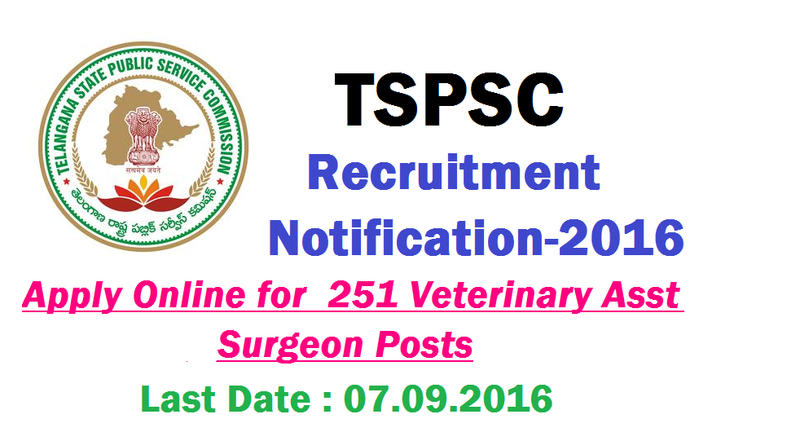 Applications are invited Online from qualified candidates through the proforma Application to be made available on Commission’s WEBSITE (www.tspsc.gov.in) to the post of Veterinary Assistant Surgeon in Animal Husbandry, Dairy Development & Fisheries Department. Qualifications:Must possess a Bachelor’s Degree in Veterinary Sciences and Animal Husbandry or its equivalent qualification from any recognized University/Institution in India or abroad. The Examination is likely to be held on Dt.25/09/2016. The Commission reserves the right to conduct the Examination either COMPUTER BASED RECRUITMENT TEST (CBRT) or OFFLINE OMR based Examination of objective type. Before applying for the posts, candidates shall register themselves as per the One Time Registration (OTR) through the Official Website for TSPSC. Those who have registered in OTR already shall apply by login to their profile using their TSPSC ID and Date of Birth as provided in OTR. The candidates who possess requisite qualification may apply online by satisfying themselves about the terms and conditions of this recruitment. Candidate has to verify the details as obtained from OTR database and displayed on the screen. If any details are to be changed, candidate should go back to the TSPSC website and use the Edit OTR link. In addition to the details obtained from OTR database, Notification specific details such as Examination Centre opted, required qualification, university details, eligibility and accepting declarations etc. are to be filled by the candidate. Preview and Edit facility is available to make changes and submit for proceeding to Next step of making online payment of fee. This page has provided me the right job that suits my qualification. I am going to apply for TSPSC Recruitment .